I have to admit that I really have a serious crush on this quilt. For whatever reason, orange has been the color of the summer for me. 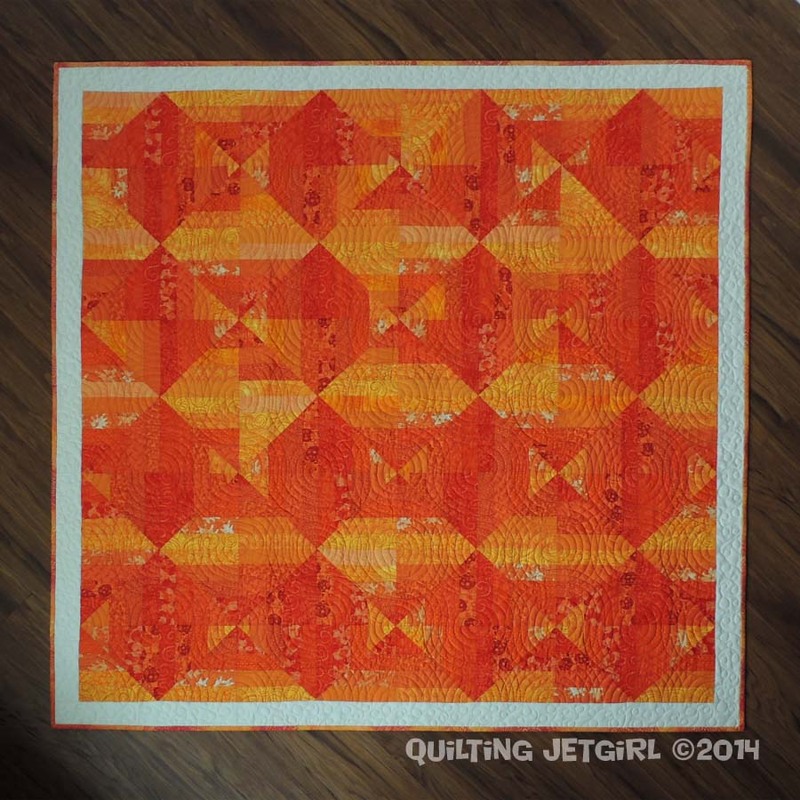 Because I kept finding myself drawn to orange, I decided to really go for it and create an ombre gradient quilt to show off the vibrant color. I chose to follow a tutorial from Leanne @ she can quilt: Blended Scraps Tutorial to make the quilt top. The tutorial is well written and I was piecing and making a lot of progress very quickly. I took a bit of time getting back to finishing this quilt because of other projects, but when I did, I decided to add a simple border out of Kona Bone to help frame the quilt. I am really glad I went with the border. If you have been following along with my progress, you know that I ran into some difficulties with dropping stitches while I was working on the quilting. I finally decided to abandon the thread I had selected for the quilting, and I changed to lighter weight (50wt) thread for the top and bottom of the quilt. This did not completely resolve all my problems, but it was much improved. I really like how the quilted spirals interlock and weave together to create a bit of softness around the brilliant, crisp orange hues and stark diamond pattern created by the design. My husband likes that he can trace along one spiral and then jump to another spiral and meander around the whole quilt organically by tracing different connecting lines. I might just love the backing on this quilt more than the top. 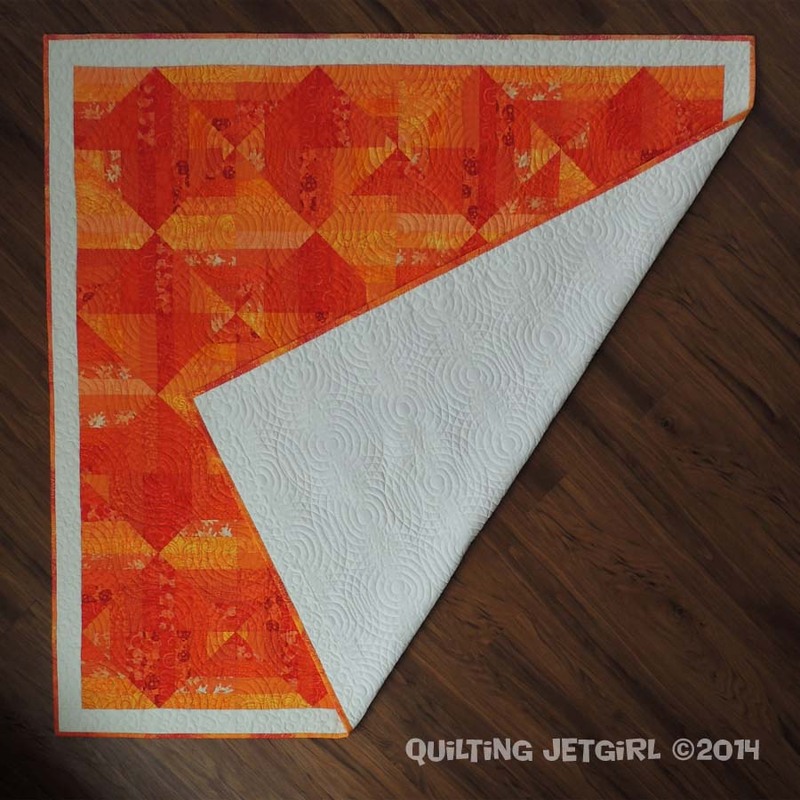 I really love its simplicity, and there is enough orange there to provide interest and remind me what the quilt is really all about (orange!). It is amazing how a solid can really make quilting designs pop. From this view, the quilting reminds me of a gentle spring rain on a calm lake – lots of rain drop ripples branching out and touching each other. 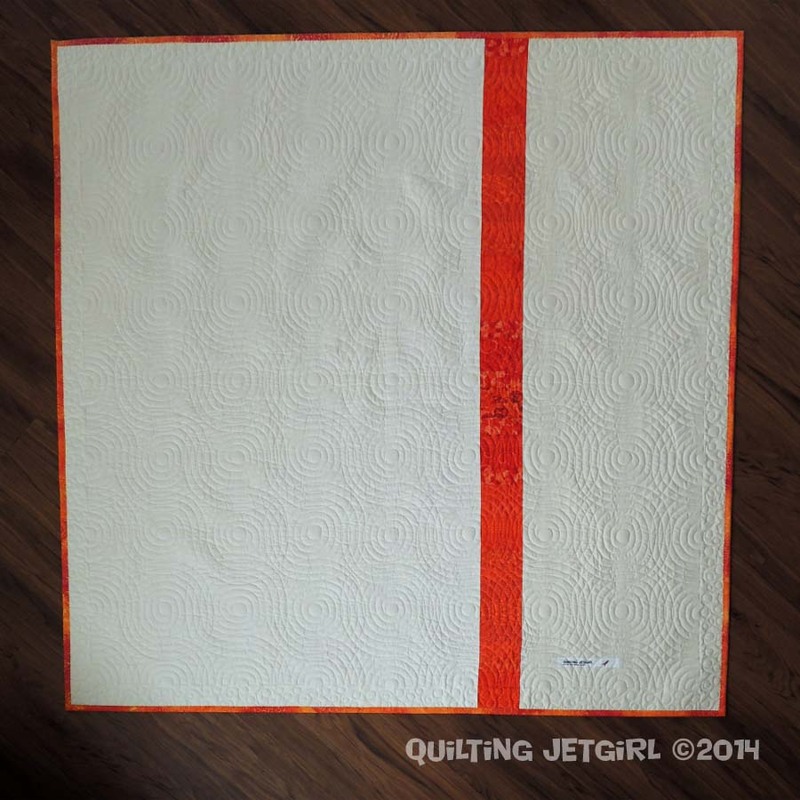 I quilted meandering loops around the Kona Bone border of the quilt, and the binding is a batik that blends from the lightest shades of orange found in the quilt to the darkest. I really like binding quilts with batiks; they create very crisp corners and are easy to hand stitch down on the back. If you look closely at the quilting detail in the photo above, you can see one of my lazy approaches to dealing with a particularly long stretch of dropped stitches. I simply doubled back and then continued forward. Effective? Yes. Attractive… not so much. This was in an area with my original thread choices. Thankfully, while I still had a dropped stitch or two after the thread change, at least the length of the areas with dropped stitches reduced significantly. 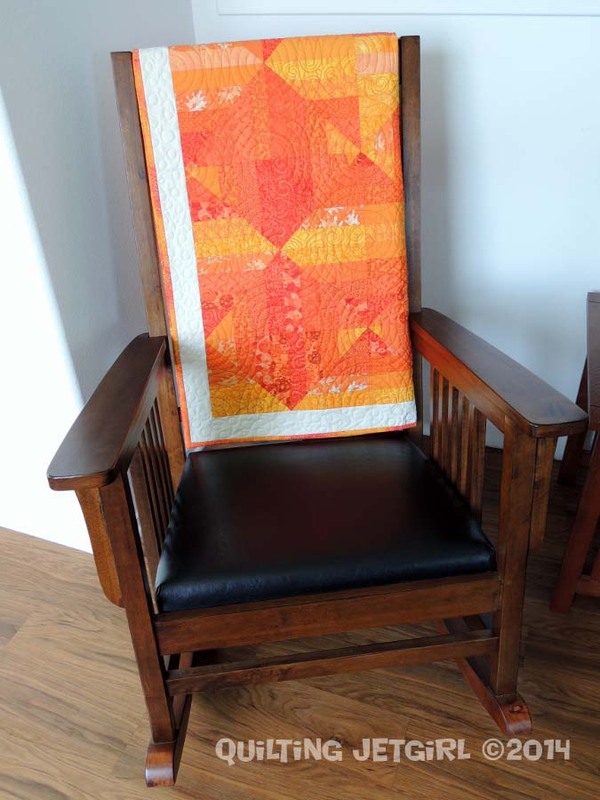 In all, I spent 10 hours quilting Orange Crush. For me, that is a very long time! The quilt took 28 hours in total from design to final stitch. Not sure I caught what thread you used on the top, colorwise. It is really really nice. Gorgeous! You may be having trouble with dropped stitches, but my trouble is…I just cannot get this thing moving in the right direction. FMQ I mean. I am even bending my needle! wow, it’s beautiful! i love the swirly quilting. Beautiful! The spiral quilting is perfect for it, like raindrops cooling flames. It really sizzles! Such a beautiful quilt! The amount of shrinking is really interesting to me. I’m going to have to measure that on my own too! The quilting looks great. There might be some long stitches but I don’t think anyone is going to examine it in detail. The pattern in orange looks cool! Hurray it’s finished! That is so frustrating with the stitches, I’ve done that same solution though! I love the texture and depth the quilting gave the angular blocks. Yvonne, this turned out spectacularly! Even with all of your struggles with dropped stitches – it is awesome! Love the texture the quilting gives, such a cool design! Such a beautiful quilt! That spiral design is spectacular – it really works with the straight lines of the piecing. I’m sorry you had issues with dropped stitches, but I’m so glad you were able to make it work. I really like this quilt. I had been slowly falling for cheerful orange in the last year or two. This has decided it: I adore orange and spirals. 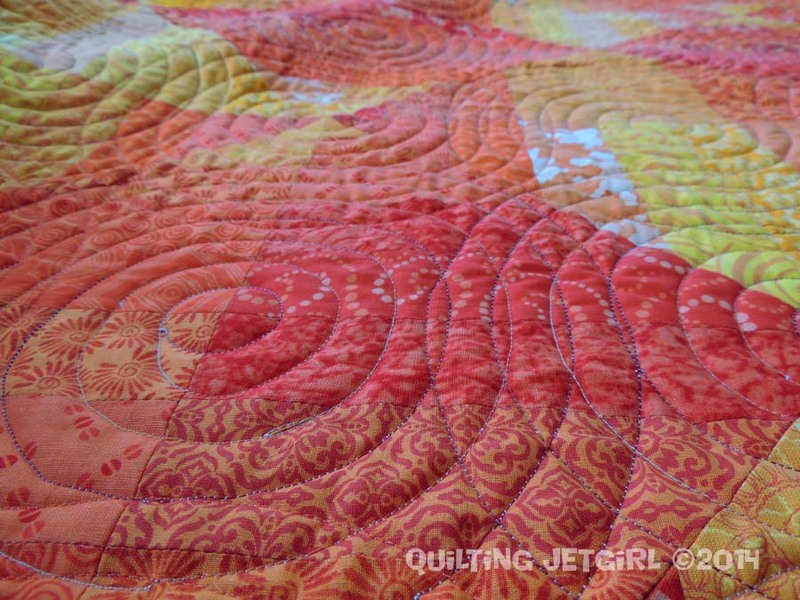 The spiral quilting is gorgeous! So glad the new thread worked better. The border really enhances the quilt, framing the center nicely. 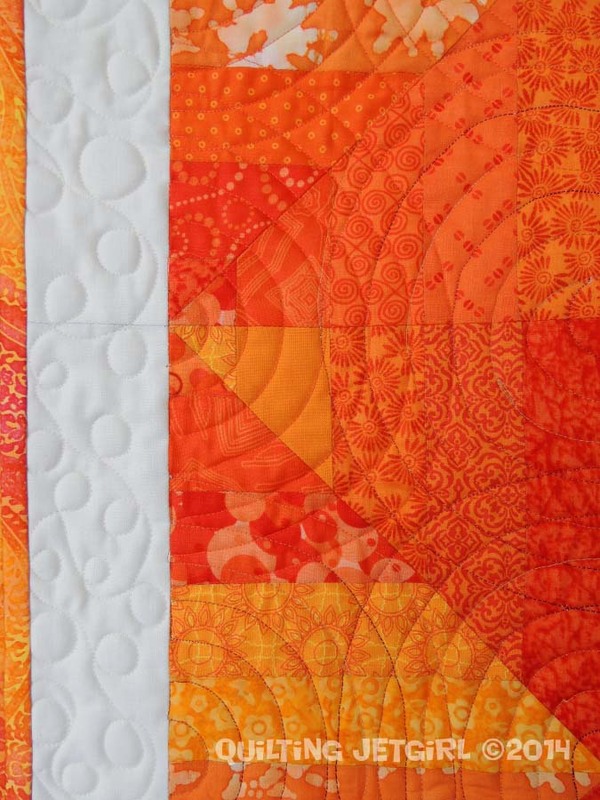 I love, love orange and this quilt is awesome! Wow, I love the texture the quilting adds, and what a great choice of motif. I also have an crush on your quilt…it’s fantastic!